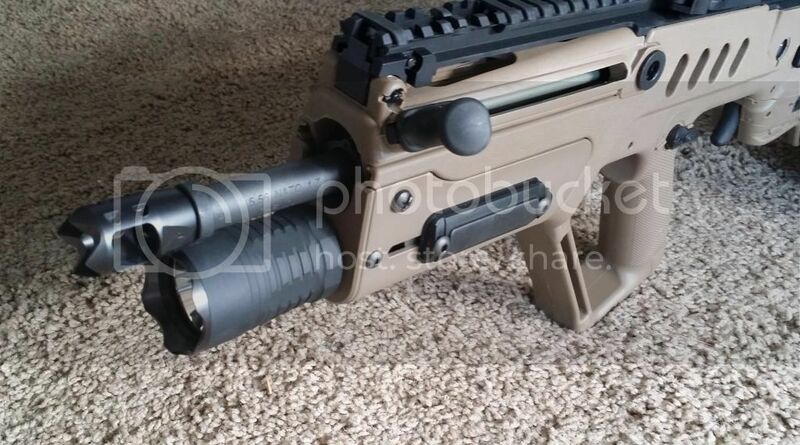 [ARCHIVED THREAD] - What light are you using in your Tavor handguard? Just got a FDE Tavor with a Gearhead Works forearm. What lights are you guys running inside your forearms?? I was using the Primary Arms light that Midwest Industries sells on their site, but I switched to the Solarforce light that Manticore Arms sells. The Solarforce battery can be changed from the front, while the Primary Arms light cannot. Plus, the Solarforce light can have a shorter body and run on one battery at 320 lumens for 90 minutes. I'm using a Surefire Fury with an XM tailcap and SR07 switch in a Manticore XLT rail. I run a Midwest Industries Extended handguard with the Primary Arms light kit. My setup looks like yours but it's a Manticore Arclight XTL rail with a Surefire 6P LED. how is yours holding up to being that close to the muzzle? I have yet to shoot mine with the light installed. It is holding up just fine. Since the A2 FH has the solid lower portion, the light is not subject to any of the muzzle blast. One nice thing about the light is that it is 700 lumens. It is absolutely blinding.